Although I have only owned this book since last gardening season – it is showing some serious signs of wear and tear as I find myself referencing it constantly in the planning of my back and front gardens. 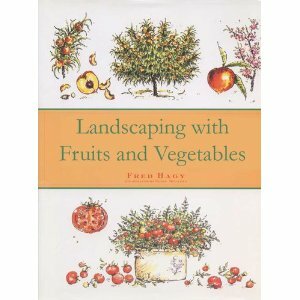 Not only useful, but exceptionally beautiful – if I was going to purchase one reference book for garden aesthetics and edibility this would be it. I know, that’s some pretty high praise, but look what you get inside – landscaping advice, sample garden drawings, practical advice and tips for various yard types, zone maps, care and maintenance information and lots of aesthetic considerations explained. And that’s not even getting into the plant information sheets. Divided by sections according to type and height, Hagy gives a full page to each cultivar with the essential information given in brief form. Here, in few words the garden landscaper can quickly look up each species for landscaping values, seasonal interest, planting considerations and tips. McCanna’s drawings which head each page make an excellent reference to tree shapes, fruit types and planting possibilities. If the tree does well in a container, it is shown in a container. If it has a particularly attractive blossom, the blossom is drawn out in detail. As a planning guide, I find this extremely helpful in that I don’t have to scan pages of text to get the answer to my immediate questions (how much sun? do I need more than one tree for fertilization? will that grow on my patio?) because the most important characteristics are pictorial, and the brief notes make for an easy scan. Though most fruits are covered in this book, the only vegetables which make an appearance are those with some aesthetic value in keeping with the focus. There is a section for plants that are primarily ornamental with some culinary value, and also some information on what grows best in containers. In the back are handy reference lists for recommended cultivar lists as well as bloom-time corrections for different parts of the US (sadly, no Canada here, we can only guess using the zone maps as a guide). As an urban gardener without acreage to plant on, I am always looking for ways to maximize both the appeal and the food-yield of my small lot. This book is one that I find inspiring in both projects every time I take it off the shelf for a browse.